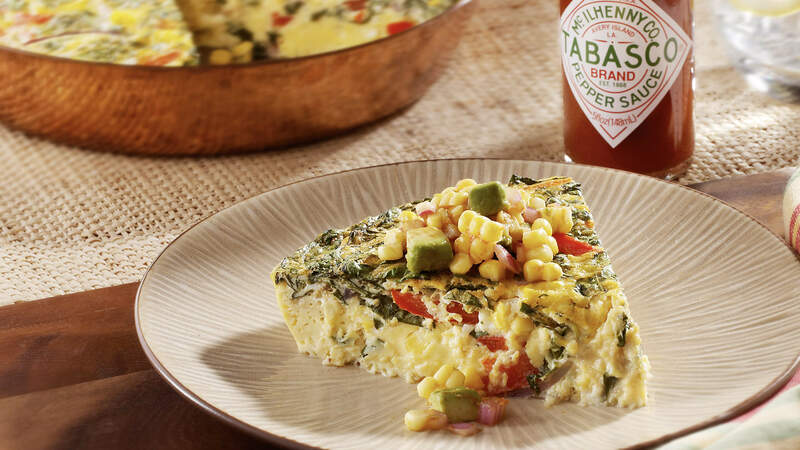 Add fiery flavor to your breakfast recipe repertoire with this Avocado and Corn Salsa Frittata, a classic baked egg dish refreshed with Southwestern salsa. 53% of consumers are interested in breakfast offerings with Mexican influences, and salsa varieties are trending on breakfast menus as way to introduce Mexican flavors. TABASCO® brand Original Red Sauce, divided --- 4 Tbsp. Eggs, large --- 8 ea. Red bell pepper, thin strips --- 1 ea. Red onion, small, thinly sliced --- 1/2 ea. Red onion, small, minced --- 1/2 ea. Kosher salt --- 1-1/2 tsp. Avocado, small dice --- 1 ea. In a stainless-steel bowl, crack 8 eggs and whisk in 2 Tbsp. TABASCO® Sauce. In separate bowl, mix ½ of corn with red bell pepper, spinach and onion. Add 1 Tbsp. TABASCO® Sauce and 1 Tbsp. kosher salt. Mix with eggs. Coat 8-inch pie dish with cooking spray. Pour in egg, TABASCO® Sauce and pepper mixture. Cook in pre-heated oven 10-15 minutes, checking the center for doneness before removing from the oven. While eggs are in the oven, in another bowl mix remaining corn, minced onion, avocado, tomato juice, ½ tsp. kosher salt, 1 Tbsp. TABASCO® Sauce. When Frittata is done, let it rest 2 minutes; then remove from pie dish. Slice into 6-8 pieces, placing 1 slice on each plate. Spoon a heaping Tbsp. of corn, TABASCO® Sauce and avocado salsa on top.